IMPORTANT!- This item is just the steering stabilizer bracket. To complete the kit, you need Roadmaster part RSSC in addition to this part. Click here to go to Roadmaster part RSSC. The 'return-to-center' concept and how it works... Take the spring from a ballpoint pen. Hold each end with a thumb and index finger and squeeze it toward the middle. Feel the pressure pushing your fingers apart? Now, gently extend the spring. Feel the pressure of the spring pulling your fingers back to the neutral position? That's what physicists call 'memory,' or the ability of a material to return to its original state. Reflex Steering Stabilizers have a tempered steel spring secured at both ends to a specially designed and valved steering damper. 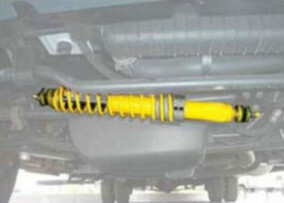 One end of the stabilizer is attached to the tie rod itself; the other end is securely fastened to the chassis undercarriage. 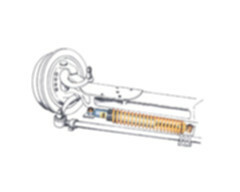 When the steering stabilizer is compressed, the spring pushes back to the neutral position. When extended, the spring pulls back to the neutral position. No matter what vehicle you have, your Reflex Steering Stabilizer installs in one hour, with no drilling or welding required. On a front tire blow out - When you blow out a front tire on your RV, the first thing that happens is the motorhome tries to make an abrupt and severe turn toward the blow out, causing you to head either into oncoming traffic or off the road. The Reflex Steering Stabilizer helps you control this situation using positive 'return-to-center' physics. Crosswinds and passing traffic - One of the most common problems RVers experience today is high crosswinds caused by passing traffic. Today's motorhomes are larger and more susceptible to these winds. When an 18-wheeler passes you, the air in front of the truck has to be moved aside. And if you are in its way, it tries to push you along with it. The Reflex Steering Stabilizer is always working to keep your steering centered, prevent oversteering and help control the RV more effectively. Road fatigue - Imagine: you just left home this morning and would really like to make the campground by nightfall. It's been five hours of heavy traffic and the sun has been shining in your eyes the whole way. Naturally, you would become fatigued. But even as your strength and response times lag, the Reflex Steering Stabilizer is using its hydraulic cylinder and spring system to keep the steering wheel centered. Rut tracking - Although the highways are better, smoother and safer these days, ruts still exist. It's not a problem until you try to change lanes or pass a vehicle; then, there is a likelihood the ruts could cause you to oversteer. With the Reflex Steering Stabilizer on board, your actions will become easier and eliminate overcompensation when steering out of a rut. Road edging - Whenever your tire temporarily drops off the edge of the pavement, it can startle even the most careful of drivers. But when your RV tends to follow the path of least resistance - heading downhill - it can be downright dangerous. This is compounded when the edge is deep or the shoulder is soft. The Reflex Steering Stabilizer will work hard to keep you going straight down the road - helping control the RV long enough to get you back on the right track. Pot holes and debris - With the Reflex Steering Stabilizer in place, the motorhome will stay straight and go in the direction you wish to travel. While pot holes and debris will cause you to move, we want that to be your decision, not the motorhome's. Comments: REFLEX STEERING STABILIZER (UNIT NEEDED RSSC).